A self-taught chef, passionate about healthy, delicious and balanced food, Catherine Kluger launched Supernature in 2017, a range of granola and organic cereal bars. With traditional or revisited recipes, both sweet and savoury, discover all the pleasures of this varied range, made exclusively in France. Toasted oat flakes, soft dried fruit, crunchy hazelnuts… Catherine Kluger has carefully selected each ingredient so as to keep nothing but the best. 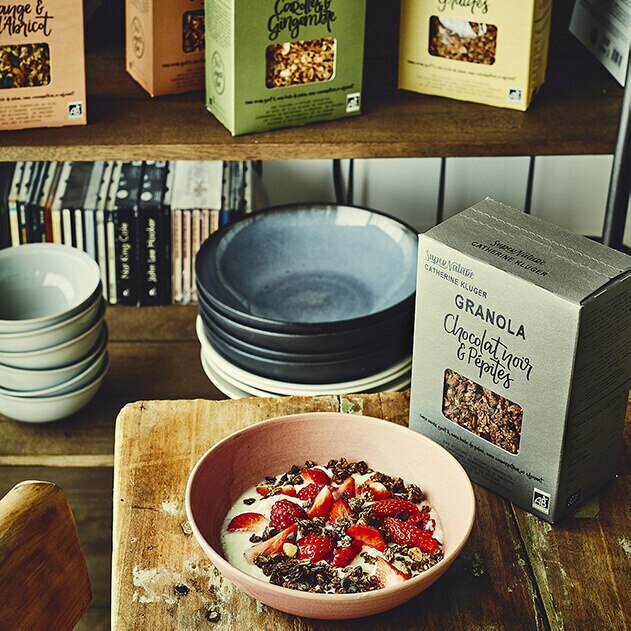 Get your fill of energy with her fruit granola (orange and apricot), her cooked and raw chocolate granola or be tempted by her savoury version with fennel and spices. Supernature granola can be enjoyed as it is or with fresh milk or a fruit sauce. They also go great in cakes or pastries to add a touch of crunch. 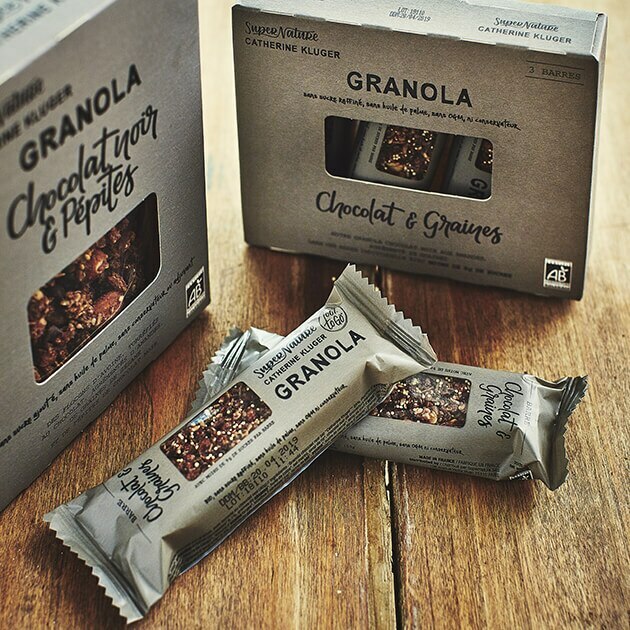 Inspired by the ever-popular granola, these cereal bars with chocolate and seeds and honey and seeds are great for on the go. Did you know…? To limit their sugar content, Catherine Kluger has brought out an innovative recipe made from rice syrup and coconut oil. Check out Catherine Kluger’s innovative chocolate mousse recipe for La Grande Épicerie de Paris. 3. 4. 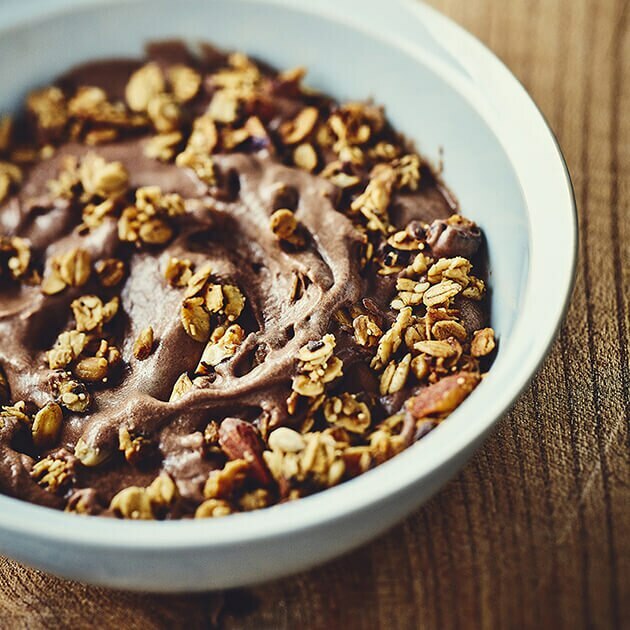 Just before serving, sprinkle your chocolate mousse with 50 g of Coffee Granola with Grains and Seeds , to retain its crunchiness. 1 - Melt 100 g of dark chocolate in a bain marie, then allow to temper. 2 - In the meantime, whip 200 ml of fresh single cream into a firm chantilly cream and mix it very gently into the melted dark chocolate in three stages. 3 - Pour the mixture into a serving dish and let cool for a minimum of 2 hours. 4 - Just before serving, sprinkle your chocolate mousse with 50 g of Coffee Granola with Grains and Seeds , to retain its crunchiness. Rolled oats toasted with a touch of fennel and Espelette chili, plus hazelnuts and pumpkin, sunflower, flax and amaranth seeds. Rolled oats toasted with honey, plus almonds, pumpkin, sunflower and sesame seeds, and a touch of cinnamon. Rolled oats toasted with honey, plus almonds, flax, sunflower and sesame seeds, and hints of apricot and orange. Rolled oats toasted with carrots and honey, plus hazelnuts, almonds, pumpkin, sunflower and sesame seeds, and a touch of ginger. Rolled oats toasted with honey and flavoured with coffee, plus a blend of almonds, hazelnuts, coffee beans and sunflower, amaranth, sesame and flax seeds.